Innovative in its approach, Brand Rewired shows you how how leading companies are abandoning the old school research-and-development-driven innovation philosophy and evolving to a Brand Rewired approach of innovating at the consumer level, using multi-disciplinary teams to build a powerful brand and intellectual asset to maximize return on investment. "How do Procter & Gamble and Google and companies like them build a billion-dollar brand? They design strong intellectual property strategy into their innovation and branding processes through the power of collaboration and interdisciplinary teams. Whether a company is maintaining a brand that has endured for more than 100 years, such as Tide, or creating a new brand that will capture the attention of the world, such as Google, a rewired branding process can provide key competitive advantages." Consider this: it's generally accepted that to achieve an increase in margin, market share, revenue, and market value, a company must innovate and create for consumer needs and wants. But renowned IP strategists Anne Chasser and Jennifer Wolfe argue in Brand Rewired that in the future—i.e., now—companies must add another layer of thinking to the creative process: an interdisciplinary approach that considers long-lasting intellectual property from the start of the creative process. Featuring surprisingly revealing interviews with executives from leading worldwide companies including Procter & Gamble, Kodak, Yahoo!, Kraft Foods, Kimberly-Clark, Harley-Davidson, General Mills, LPK, JWT, Scripps Networks Interactive, Northlich, and more, this book is not just another IP strategy guide. This is the strategic direction every brand manager, marketing professional, intellectual property lawyer, valuation professional, intellectual asset manager, intrapreneur, or entrepreneur needs to gain a step on the competition. "Brand Rewired celebrates collaboration and the power of brands. It's a must-read for all brand managers and business leaders." "Brand Rewired is a must-read for everyone who wants to create sustainable brand value. Anne and Jennifer provide an insightful view on how a stronger brand can be built and more long-term value can be created by designing in a holistic intellectual property strategy from the start." "This book spells out for all brand owners the clear economic advantages to placing intellectual property at the heart of the branding process." "One company, many departments, hundreds or thousands of brands. How does management coordinate brand development and protection to maximize the company's assets and the customer's experience in a rapidly changing global economy? Brand Rewired is filled with creative ideas and commonsense recommendations to help the stewards of famous and one-day famous brands answer that question. Buy it and prosper." "Brand Rewired takes an age-old problem and shows how leading companies are creating greater value by driving collaboration with all brand stakeholders at the front end of the innovation cycle, where strong intellectual property protection means greater return on investment for brand owners." 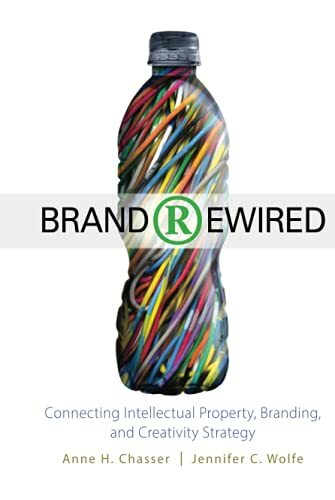 "Brand Rewired offers a fresh new look at driving value and innovation through a creative collaboration. It's a wonderful complement to building enterprise success." Chasser, Anne H.; Wolfe, Jennifer C.
Chasser, Anne H., Wolfe, Jennifer C.